Linking Western Australia’s south-west corner with its tropical north, this Coral Coast journey takes travellers 1270km from Perth to the fabulous Ningaloo Reef, past some of the state’s best coastal scenery. turu.com.au showcases a selection of holiday parks to book on the Coral Coast, including camping, caravan and cabin accommodation. Some sections of this trail traverse quite hot, dry regions. Carry water and supplies and be prepared for temporary road closures (even on the highway) after unseasonal rain. Drinking water is in very short supply north of Carnarvon – carry extra in these areas. Always carry a first aid kit. The RFDS covers most areas – contact roadhouses or towns for emergency help. Winter and spring are the best times to visit. August and September are best for wildflowers. 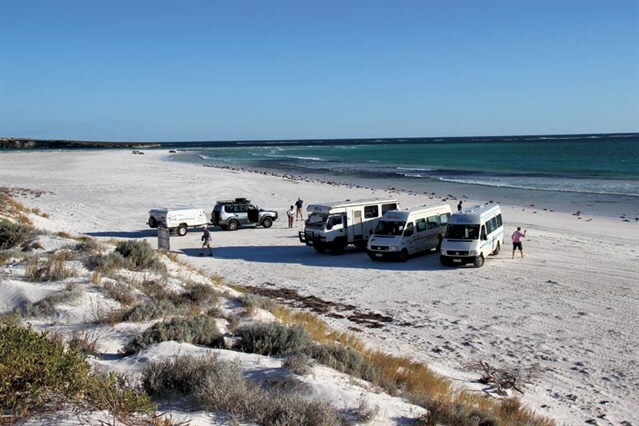 Begin your journey by heading north from Perth towards Guilderton before continuing your journey north towards Lancelin - famous for its sand dunes, 4WDing, Western rock lobsters (crayfish) and windsurfing. Pick up the relatively new Indian Ocean Drive to Cervantes. This new sealed road takes travellers along the coast, past the previously remote but attractive squatters’ settlements of Wedge Island and Grey before reaching Nambung National Park and The Pinnacles. First time visitors to The Pinnacles are usually quite amazed at what they find – thousands of tall limestone spires and shapes, some measuring up to 4m high, seemingly frozen in time. There are driving and walking trails through this wonderful, eerie landscape. Just up the road is the fishing village of Cervantes, which is famous for its crayfish. 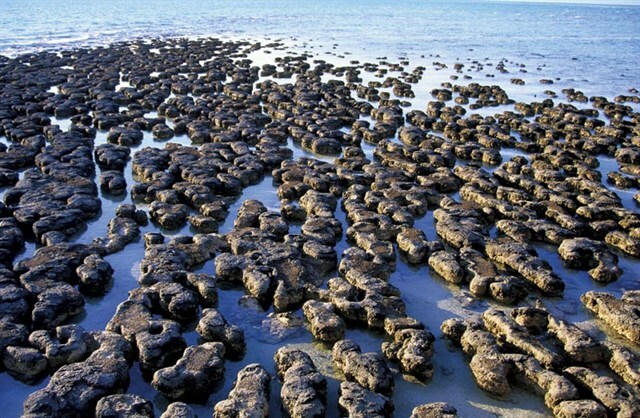 Check out the ancient ‘living rocks’ – stromatolites – growing in the heavily salt-laden waters of Lake Thetis on the edge of town. Here, you can see examples of the oldest form of life on earth, with early specimens known to have existed some 3500 million years ago. 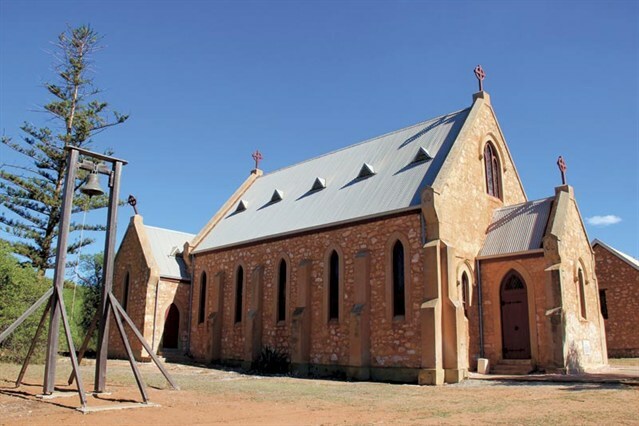 From here, we pick up the Brand Highway and head into Dongara and Port Denison, which have plenty of historic old buildings along a heritage trail. The lovely old Moreton Bay Figs growing along the Dongara main street is an impressive sight. And if you are yearning for a yummy treat for morning tea, call into the Dongara Bakery – their pastries and pies are to die for! Down by the water at Port Denison is a picturesque harbour, a protected swimming beach and children’s playground and a couple of caravan parks on the beachfront. Back on the road, look out for the well-known ‘leaning trees’ – eucalypts which, under the prevailing strong winds across the Greenough Flats, have been bent over and are growing horizontally along the ground. They are icons of the area. Close by is Geraldton, the largest centre between Perth and Darwin. With an active port servicing the local mining/grain industries, a large commercial fishing fleet, a new boat harbour/marina, and revitalised waterfront, Geraldton is a good spot to stop and replenish supplies before heading north. Heading north along Highway 1, the next main coastal centre is Kalbarri. On the southern approach to the town, take a look at the dramatic coastal cliffs including Island Rock, Natural Bridge, Pot Alley Gorge, Mushroom Rock and Red Bluff – they are all quite spectacular, particularly in the afternoon light. Between June and November, whales can often be seen breaching and playing along the coast. In Kalbarri itself, there are a number of attractions to keep you busy. These include pelican feeding on the river foreshore, a visit to the award-winning parrot breeding centre at Rainbow Jungle, checking out the fascinating Seahorse Sanctuary, hiring a canoe and paddling up the Murchison River or a scenic boat tour. For the energetic, try horse riding along the river, sand boarding on huge dunes, an extreme offshore jet boat ride, take a fishing charter or go surfing at Jacque’s Point – a well-known big wave surfing spot. And when you’re through with all this exercise and want a change from camp cooking, try a seafood meal at Finlay’s – a great rustic atmosphere and the food is legendary! 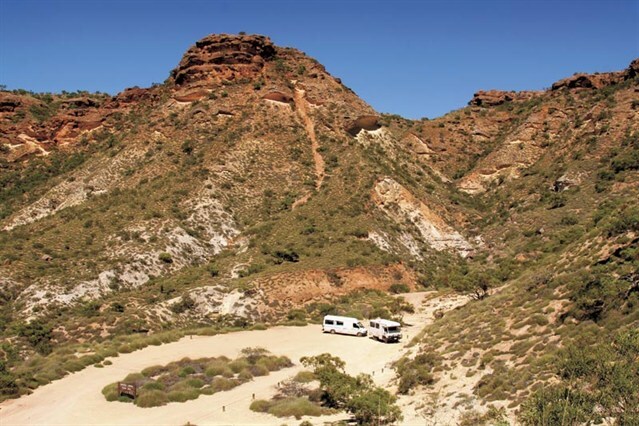 A short drive out of town takes visitors to Kalbarri National Park including Nature’s Window, The Loop, Z Bend, Hawk’s Head and others – this spectacular gorge country is easily accessible via walking tracks from nearby car parks. These are ‘day visit’ sites and no caravans are allowed. In spring, this splendid national park has a wonderful array of wildflowers. Heading further north, Billabong and Overlander roadhouses are both good spots for a break. 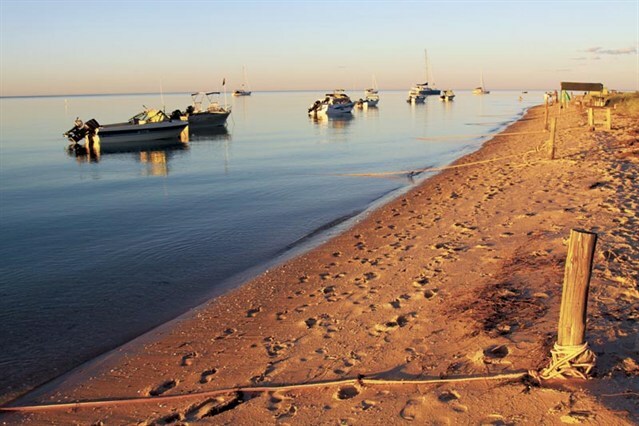 If you are interested in fishing, there are plenty of spots in Shark Bay to beach fish or to launch your dinghy. And if you’re after the really big ones, there are a number of chartered fishing tours available. Some of the best and quite spectacular cliff-top fishing anywhere in the country can be found across at Steep Point on the western flank of Shark Bay (4WD access only). On your way out of town, don’t miss the boardwalk/lookout at Eagle Bluff and the amazing Shell Beach which has a 100km long beach made up of billions of shells (coquina) about 10m deep. These compacted shells can be quarried and Denham has several roads and buildings, including a restaurant and church, made from these shell blocks. Carnarvon is the largest centre in the Gascoyne region. Well-known for its wonderful tropical fruit and vegie production, this busy centre also has an active commercial fishing operation and with a warm winter climate, is becoming increasingly popular as a tourist destination. A visit to Carnarvon’s heritage precinct, including its famous One Mile Jetty (c. 1897), is worthwhile and you’re sure to enjoy your ride in the ‘Coffee Pot’, a quaint little train out to the end of the historical jetty. Out of town, you’ll cross the normally wide, dry Gascoyne River. What is unseen, however, is that the river continues its flow of water underground – the mainstay of all those crops back in Carnarvon. A few kilometres further on, another side trip (49km) takes visitors out to the spectacular coast at Point Quobba and the blowholes. Operated by the local shire, the basic camping area is right on the coast at Point Quobba with a lovely protected beach and coral filled lagoon and the spectacular blowholes, powered by huge ocean swells, spurting up to 20m in the air. Along the coast, a track leads northwards to Quobba Station which has camping and cabins, more cliff-top fishing and another memorial to HMAS Sydney. Returning to the highway, Minilya Roadhouse, is another welcome sight just over 100km up the road. A few kilometres north is the final highway turnoff for this trip – to Coral Bay and the Ningaloo Coast. Stretching over 260km to the tip of North West Cape, the beautiful Ningaloo Reef is a world-class coral reef with 200 different coral species and more than 500 varieties of fish – diving, snorkelling and fishing here all have great appeal. In many places, the reef comes to within a few metres of the beach, so you can simply walk into the water and you’re instantly among some of the nicest corals in the world. Coral Bay, on the southern section of the reef, is a small but busy holiday centre. Fishing charters are available, as well as coral viewing boats, 4WD bike hire, and glass-bottom canoes, or you can just snorkel over coral near the beach and enjoy a variety of cafés and restaurants – it’s a delightful little spot. Having now arrived at the end of our trail in such an appealing place, it’s now only a matter of deciding where to stay and what to do first – maybe a nice feed of prawns would be a good start.